A lot of my friends are taking part in a meatless October challenge on Facebook (meatless October = lihaton lokakuu, it alliterates nicely in Finnish!) that started off as a challenge on a TV show. I obviously saw the event trending and decided to join in as well, to some extent at least. I've been wanting to cut back on meat anyway. I don't eat huge amounts of meat, but the "vegetarian" meals I consume are normally just pasta and tomato sauce or different kinds of soups. I used to be quite picky as a kid, but I've mostly grown out of it. Nowadays the only thing I really stay away from is mushrooms. I've tried, but I can't. The taste, the consistency... No. Anyway, I was thinking I would take on this challenge, just quite light heartedly. I'm not gonna demand that people make vegetarian food just for me if I'm over at their house, for example. And then some things happened. For one I found out that Syö! started today. For about 2 weeks, a bunch of restaurants in Helsinki (and other parts of Finland!) have offers for 10e. And that's cheap for eating out in Finland. So my basis for my "meatless month" isn't gonna be shunning meat entirely, but to cut back and most of all get adventurous and experimental with my own cooking. I'm not gonna cook meat, and I'm gonna try new sorts of vegetarian foods at home. I want to get used to eating vegetarian food that isn't just pasta and soup. I created an entire vegetarian food board on Pinterest to help me stay inspired! 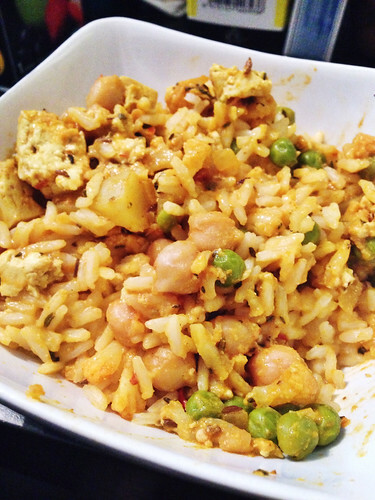 So on Tuesday, October 1st I decided to make a tofu and cauliflower curry that both looked and sounded delicious. We make a coconut milk based curry with chicken all the time, so mostly I just took this as inspiration for what to replace the chicken with. Well I have to say, it was not delicious at all. And a pretty bad start to an already sort of poorly timed meatless month :D Not very inspirational. 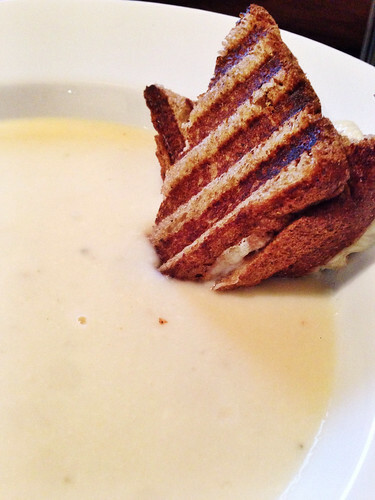 Cheesy cauliflower soup, grilled cheese. Last night I opted for something more familiar, a soup... Not very adventurous. I hadn't made a cauliflower soup before, but I've always wanted to. Just never got around to it, but since we had a bunch of leftover cauliflower from the curry, I decided to go for it :) And this was delicious. So mild and smooth and nicely cheesy. Not necessarily the healthiest, but perfect for the cold weather. And finally, Joel and I decided to go out for dinner in honor of the 10e menus tonight. We chose Morrison's , because in the past years it's definitely turned out to be one of our favorites during these weeks. I don't think we've ever gone there unless it's been Syö!, even though the burgers are really good. We just don't eat a lot of burgers I guess... I surprised even myself by actually really sticking to my promise of being more adventurous and went for a veggie burger and halloumi, which turned out to be surprisingly delicious! I'm quite proud of myself. So yeah, any tips and vegetarian recipes are greatly appreciated! How the heck do you cook good tofu?! Tarviit mun hostäidin blogia!!! Kaikki reseptit on kyl vegaaneja, mut voit muuttaa ne sopiviksi ja esim soijamaidon tai -kerman sijaan käyttää normaalia. Se linkki on mun uusimmassa postauksessa! Joo kattelinki sitä, näytti just hyvält! Ja ei mua se vegaaniuskaa haittaa:) thanks! Hehe, toivottavasti onnistut paremmin ku mä :P Mut joo, en meinaa liikaa rajoja asettaa itelleni ettei tuu ihan liian pakkopullaa ja kaikki into sit vaan lopahda haha. Haluutko sen kurpitsakeiton ohjeen??? Entä kaalilaatikon? Kaalilaatikon voi tehdä ilman jauhelihaa. Se kaalilaatikon ohje mul on! Mut joo laita vaa se kurpitsakeiton ohje! :) Thanks!! !